Many current movement data sources provide more or less continuous streams of object locations. For example, the AIS system provides continuous locations of vessels (mostly ships). This continuous stream of locations – let’s call it track – starts when we first record the vessel and ends with the last record. This start and end does not necessarily coincide with the start or end of a vessel voyage from one port to another. The stream start and end do not have any particular meaning. Instead, if we want to see what’s going on, we need to split the track into meaningful segments. One such segmentation – albeit a simple one – is to split tracks by day. This segmentation assumes that day/night changes affect the movement of our observed object. For many types of objects – those who mostly stay still during the night – this will work reasonably well. 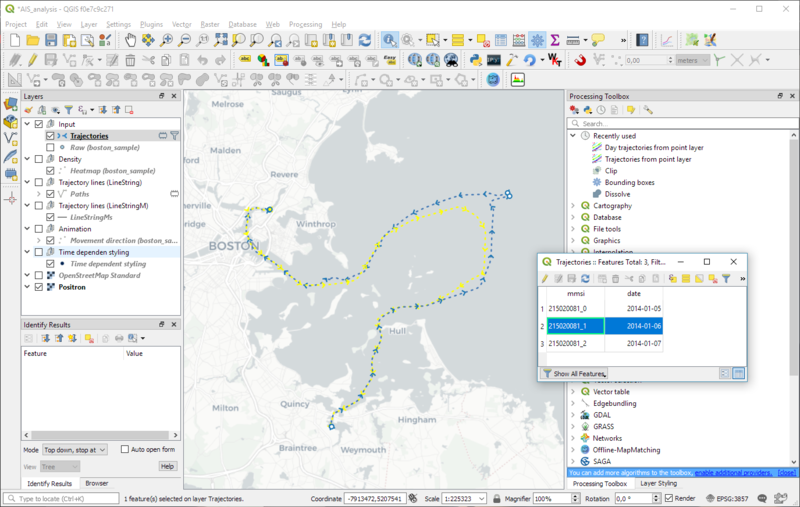 For example, the following screenshot shows raw data of one particular vessel in the Boston region. 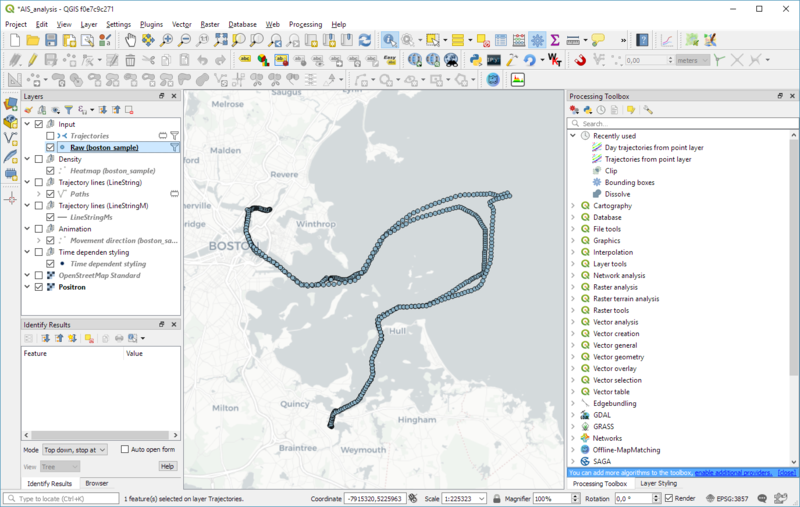 By default, QGIS provides a Points to Path to convert points to lines. This tool takes one “group by” and one “order by” field. Therefore, if we want one trajectory per ship per day, we’d first have to create a new field that combines ship ID and day so that we can use this combination as a “group by” field. Additionally, the resulting lines loose all temporal information. To simplify this workflow, Trajectools now provides a new algorithm that creates day trajectories and outputs LinestringM features. Using the Day trajectories from point layer tool, we can immediately see that our vessel of interest has been active for three consecutive days: entering our observation area on Nov 5th, moving to Boston where it stayed over night, then moving south to Weymouth on the next day, and leaving on the 7th. 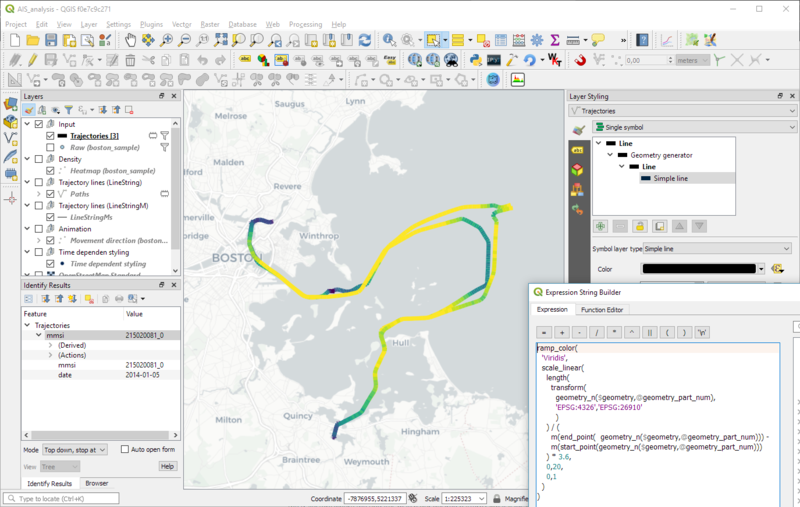 We’ve seen a lot of explorative movement data analysis in the Movement data in GIS series so far. 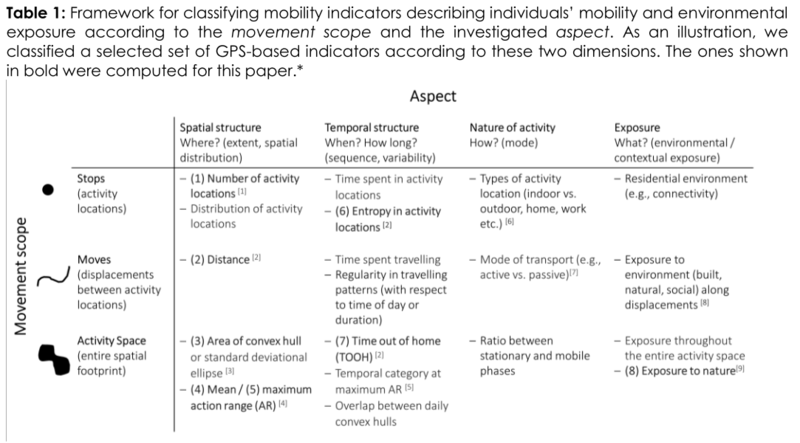 Beyond exploration, predictive analysis is another major topic in movement data analysis. One of the most obvious movement prediction use cases is trajectory prediction, i.e. trying to predict where a moving object will be in the future. The two main categories of trajectory prediction methods I see are those that try to predict the actual path that a moving object will take versus those that only try to predict the next destination. Today, I want to focus on prediction methods that predict the path that a moving object is going to take. There are many different approaches from simple linear prediction to very sophisticated application-dependent methods. Regardless of the prediction method though, there is the question of how to evaluate the prediction results when these methods are applied to real-life data. But what if the trajectory is irregularly updated? Do we interpolate the positions at the desired five minute timestamps? Do we try to shift the sample until – by chance – we find a section along the trajectory where the updates match our desired pattern? What if location timestamps include seconds or milliseconds and we therefore cannot find exact matches? Should we introduce a tolerance parameter that would allow us to match locations with approximately the same timestamp? Depending on the duration of observation gaps in our trajectory, it might not be a good idea to simply interpolate locations since these interpolated locations could systematically bias our evaluation. Therefore, the safest approach may be to shift the sample pattern along the trajectory until a close match (within the specified tolerance) is found. This approach is now implemented in MovingPandas’ TrajectorySampler. expected_result = "POINT (0 19)"
expected_result = "LINESTRING (0 9, 0 10, 0 14)"
Many of my previous posts in this series  have relied on PostGIS for trajectory data handling. While I love PostGIS, it feels like overkill to require a database to analyze smaller movement datasets. Wouldn’t it be great to have a pure Python solution? Pandas was developed in the context of financial modeling, so as you might expect, it contains a fairly extensive set of tools for working with dates, times, and time-indexed data. Of course, this class can be used in stand-alone Python scripts, but it can also be used in QGIS. 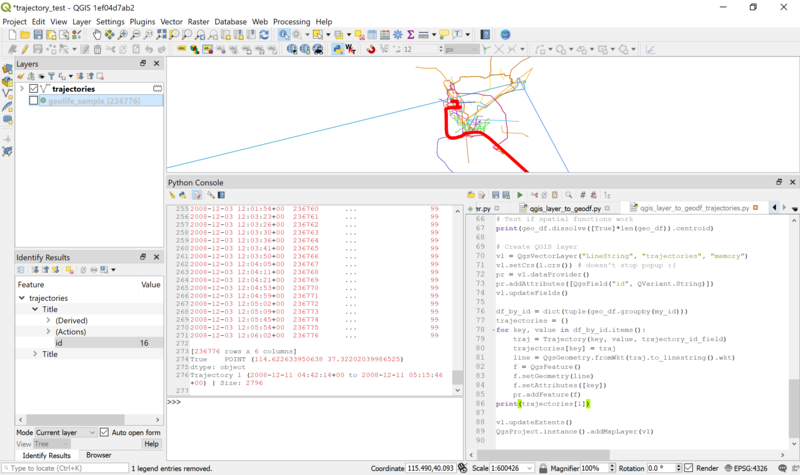 The following script takes data from a QGIS point layer, creates a GeoDataFrame, and finally generates trajectories. These trajectories can then be added to the map as a line layer. All we need to do to ensure that our data is ordered by time is to set the GeoDataFrame’s index to the time field. From then on, Pandas takes care of the time series aspects and we can access the index as shown in the Trajectory.get_position_at() function above. 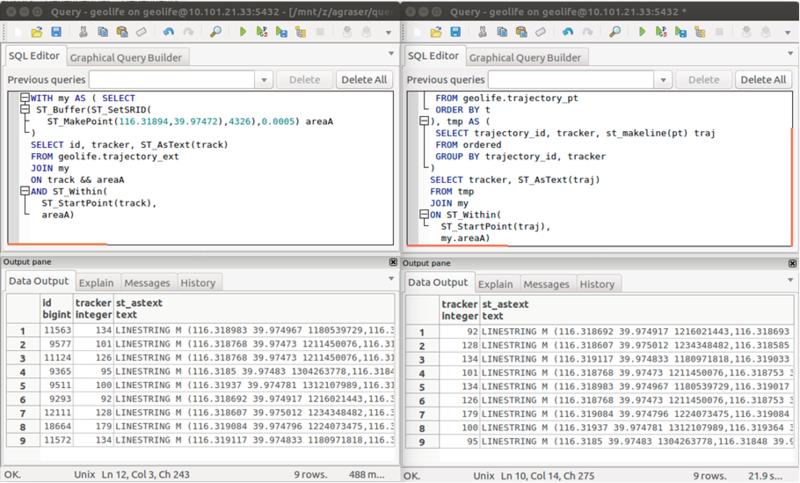 The following screenshot shows this script applied to a sample of the Geolife datasets containing 100 trajectories with a total of 236,776 points. On my notebook, the runtime is approx. 20 seconds. 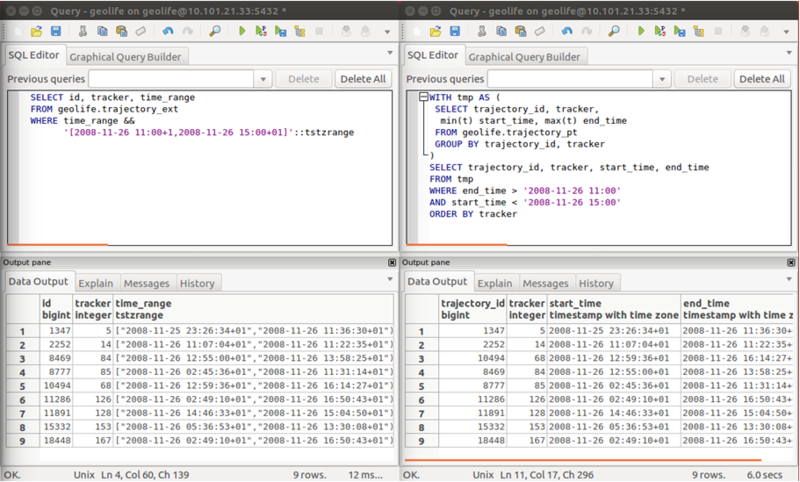 So far, GeoPandas has proven to be a convenient way to handle time series with coordinates. Trying to implement some trajectory analysis tools will show if it is indeed a promising data structure for trajectories. Do you sometimes start writing an SQL query and around at line 50 you get the feeling that it might be getting out of hand? If so, it might be useful to start breaking it down into smaller chunks and wrap those up into custom functions. Never done that? Don’t despair! 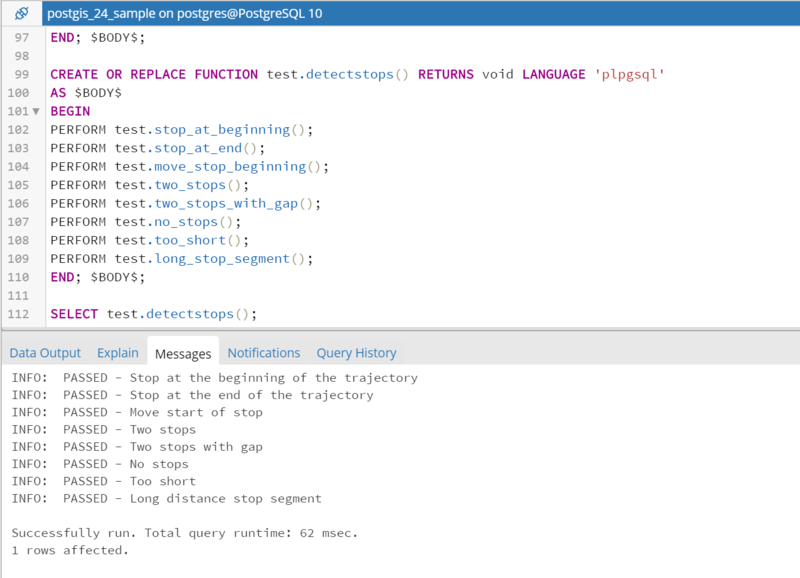 There’s an excellent PL/pgSQL tutorial on postgresqltutorial.com to get you started. Note how this function uses RETURNS TABLE to enable it to return all the stops that it finds. To add a line to the output table, we need to assign values to the sequence and geom variables and then use RETURN NEXT. -- here comes the magic! While this function is not really short, it’s so much more readable than my previous attempts of doing this in pure SQL. Some of the lines for determining is_stop are not strictly necessary but they do speed up processing. Performance still isn’t quite where I’d like it to be. I suspect that all the adding and removing points from linestring geometries is not ideal. In general, it’s quicker to find shorter stops in smaller areas than longer stop in bigger areas. Looking for a testing framework for PL/pgSQL, I found plpgunit on Github. While I did not end up using it, I did use its examples for inspiration to write a couple of tests, e.g. One issue that Laxmi particularly highlighted was the fact that many local communities are fighting excessive traffic caused by apps like Waze that suggest shortcuts through residential neighborhoods. Just because we can do something with (mobility) data, doesn’t necessarily mean that we should! Of course, I also presented some new work of my own, specifically my research into PostGIS trajectory datatypes which I’ve partially covered in a previous post on this blog and which is now published in Graser, A. (2018) Evaluating Spatio-temporal Data Models for Trajectories in PostGIS Databases. GI_Forum ‒ Journal of Geographic Information Science, 1-2018, 16-33. DOI: 10.1553/giscience2018_01_s16. My introduction to GeoMesa talk failed to turn up any fellow Austrian GeoMesa users. So I’ll keep on looking and spreading the word. The most common question – and certainly no easy one at that – is how to determine the point where it becomes worth it to advance from regular databases to big data systems. It’s not just about the size of the data but also about how it is intended to be used. And of course, if you are one of those db admin whizzes who manages a distributed PostGIS setup in their sleep, you might be able to push the boundaries pretty far. On the other hand, if you already have some experience with the Hadoop ecosystem, getting started with tools like GeoMesa shouldn’t be too huge a step either. But that’s a topic for another day! Since AGIT&GI_Forum are quite a big event with over 1,000 participants, it was not limited to movement data topics. You can find the first installment of English papers in GI_Forum 2018, Volume 1. As I understand it, there will be a second volume with more papers later this year. This post is part of a series. 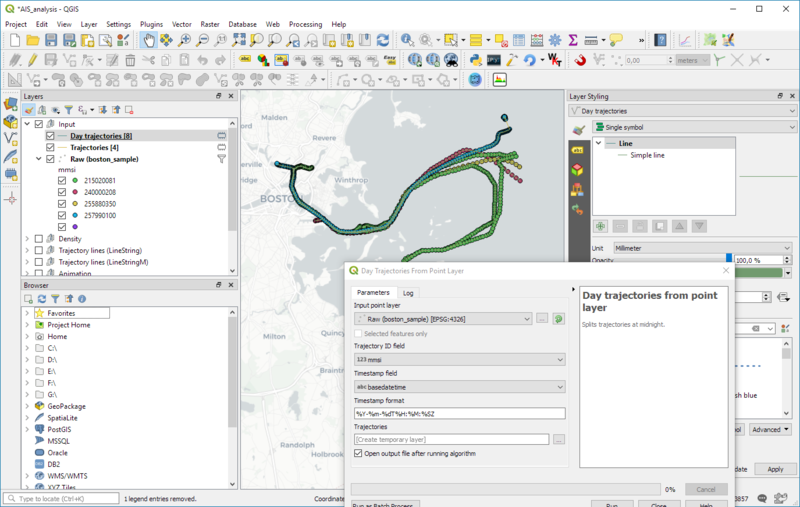 Read more about movement data in GIS. 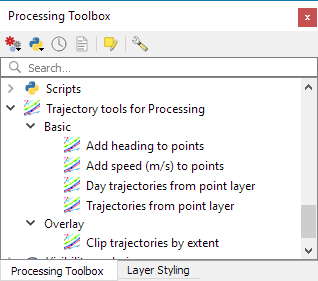 In short: both writing trajectory queries as well as executing them is considerably faster using PostGIS trajectories (as LinestringM) rather than the commonly used point-based approach. Here are a couple of examples to give you an impression of the differences. Spoiler alert! 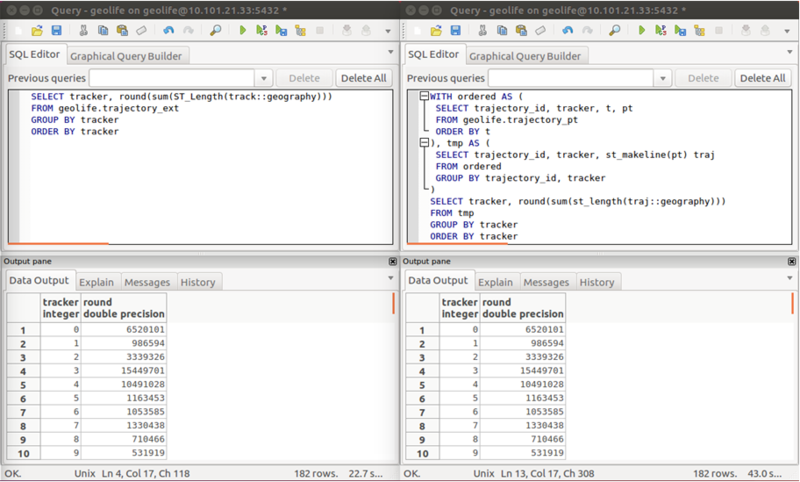 Trajectory queries are up to 500 times faster than comparable point-based queries. 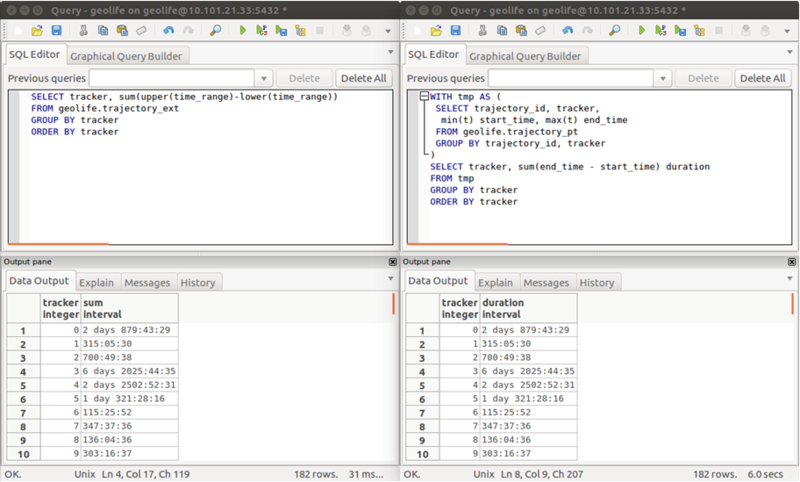 In both cases, we have indexed the tracker id, geometry, and time columns to speed up query processing. First, let’s see how to determine trajectory length for all observed moving objects (identified by a tracker id). Graser, A. (2018) Evaluating Spatio-temporal Data Models for Trajectories in PostGIS Databases. GI_Forum ‒ Journal of Geographic Information Science, 1-2018, 16-33. DOI: 10.1553/giscience2018_01_s16. You can find my fork of the PG-Trajectory project – including all necessary fixes – on Bitbucket.